lower right: J.F. Cropsey / .1857. Commissioned by Cyrus W. Field [1819-1892], New York; his daughter, Mrs. William Francis Judson; her son, Cyrus Field Judson; his daughter, Mrs. Frank McCoy, Washington; (Hirschl & Adler Galleries, New York), from 1977; sold 1982 to private collection, possibly Mr. and Mrs. Norman Hirschl, West Stockbridge, Massachusetts; gift 1991 to NGA. Annual Exhibition, National Academy of Design, New York, 1857, no. 191. Recent Acquisitions of American Art 1769-1938, Hirschl & Adler Galleries, New York, 1979, no. 22, color repro. The Art of Collecting, Hirschl & Adler Galleries, New York, 1984, no. 13, repro. Adventure and Inspiration: American Artists in Other Lands, Hirschl & Adler Galleries, New York, 1988, no. 25, color repro. Jasper Francis Cropsey's 'The Spirit of War' and 'The Spirit of Peace', National Gallery of Art, Washington, D.C., 1994-1995, brochure, no. 9, repro. The support is a fine, plain-weave fabric that has been lined. The ground, a warm, rosy buff color, is used as a mid-tone in the sky and is visible on the tacking margins. Paint is sparsely applied, with impasto restricted to highlights such as in the foliage and the central castle chimney. 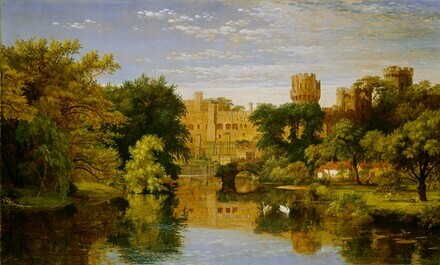 Various techniques, including scumbling in the sky and water and transparent multilayer glazing over opaque and transparent base colors in the foliage and castle, were employed. A transparent brown wash appears to have been laid under the darker areas of foliage, reflections, and cottages, while the architecture appears to have been built upon a layer of white paint interposed between the ground and the rendering. Lighter foliage areas are underpainted in an ocher-toned base, then richly glazed with layers of transparent red, green, and brown. Pentimenti are visible in the lowering of the tree line at left and shifting of a spire at right, but no major changes in composition are evident. There is a 4-cm vertical scratch in the right foreground just below the white cottage and limited inpainting in the sky at left. A past lining has caused several alterations to the painting, including an overall weave emphasis and the formation of numerous lumps in the upper half of the painting. The varnish has not discolored. Harper's Weekly (6 June 1857): 355. The Crayon (July 1857): 221. Talbot, William S. Jasper F. Cropsey 1823-1900. Exh. cat. National Collection of Fine Arts, Washington, D.C., 1970: 31. Talbot, William S. "Jasper F. Cropsey, 1823-1900." 2 vols. Ph.D. dissertation, Institute of Fine Arts, New York University, 1972. Kelly, Franklin, with Nicolai Cikovsky, Jr., Deborah Chotner, and John Davis. American Paintings of the Nineteenth Century, Part I. The Collections of the National Gallery of Art Systematic Catalogue. Washington, D.C., 1996: 114-118, color repro.